Earlier this month, I took a little weekend trip to Montreal, in the province of Quebec. While Ottawa, where I live, is a city that is more or less bilingual with most people somewhat being able to communicate in French and English, crossing the river that separates Ottawa (in the province of Ontario), and the Quebec side, can sometimes feel like entering into a whole new world. While Canada has two official languages – English and French – Quebec is the only province in the country whose sole official language is French. And while the language plays a big part – that, along with the culture, and history of Quebec – add to Quebec feeling like a completely different country. I’ve been to Quebec enough times to know that when you’re going there, if you’re able to, you should expect to speak in French while there – not only because there are some people who don’t speak English, but because, for many, it’s a matter of respect for their language and culture. That’s why I was pretty shocked at one point when my Francophone friend and I were out shopping during my latest trip to Montreal. My friend asked the salesgirl a question in French about a pair of boots she was looking at. The clerk stared at her blankly. My friend repeated her question and the salesgirl just stood there, like a deer in headlights and eventually pointed us to another salesperson who spoke French. While my friend didn’t say anything to me about it, I was fuming and had to try hard to hold back my stink-eye. Instantly, my mind wandered to Tibet. I thought about what it would feel like, to be a Tibetan in Tibet, on my own land, and not be understood in my own language. Obviously, and sadly, this isn’t uncommon. Since China’s occupation, they have been working intensely at eradicating our language, culture and religion – significant components of our sense of self and identity. The state-sponsored influx of Chinese people into Tibet has only helped with the cultural genocide that is taking place inside Tibet – with Tibetans being the minority in many cities. When I see pictures of Tibet, I most often see store front signs in large Chinese writing, then underneath smaller in Tibetan writing, if any. I’ve heard many stories about young Tibetans in Tibet not being able to communicate with elders because they can no longer speak Tibetan after having to attend Chinese language schools if they want a good job, or because of Chinese policies of implementing Chinese language to be the main language of study in Tibetan schools. I thought about how here in Canada, they have programs to promote the French language. Although I grew up in Ontario, at my school we had the option of taking classes in English or French. From grade 4 to 12, nearly all my classes were taught in French with the exception of gym class, and obviously English. This is unlike how things are done in China, where they incessantly try to shut Tibetans up. 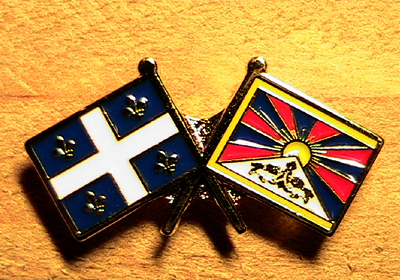 I won’t go into comparing Canada and Quebec vs. China and Tibet, since it can get complex, and irritably, it’s a card that China likes to play against Canada when the Canadian government raises Tibet with Chinese leaders. However, you can’t deny that in Quebec, Quebeckers have the right to learn in French, right to hold a Quebec flag freely, right to call yourself a separatist and be voted into office for your political stance, be able to become Prime Minister of Canada, and even have the right to demand for freedom from Canada without being jailed, tortured, or worse killed. As a matter of fact, in 1980 and 1995, Quebec held referendums for sovereignty, although both were defeated – in 1995 Quebec nearly gained sovereignty, incredibly, the ‘no’ vote was 50.6% to the ‘yes’ vote of 49.4%. Perhaps all this information flowing through my mind was what caused me to react so irritable when that salesgirl didn’t understand my friend speaking in French. But I think for many Tibetans, almost no situation that even remotely relates to Tibet is just plain black and white for us, our minds always turn to Tibet and our Tibetaness, causing us to react differently than most in all types of situations – just look at how most Tibetans in the United States are reasoning how to vote in the upcoming presidential elections. Just to add to the whole Canada component; I grew up in Timmins (Northern Ontario) and most people spoke French fluently. It’s pretty much impossible to get a job without being fluent and French and none of the schools in the area offered English schooling for kids younger than Third Grade. It just seems strange that people would be able to get jobs in Montreal without speaking French, if people I know couldn’t get jobs in Ontario without speaking French. Do you happen to know if Montreal has any bylaws requiring certain percentages of the population to speak French and/or English? When I was there last, I don’t think I spoke English at all.. Thanks for your comment shiggs91. Yes, I’m aware that there are many communities in Sudbury, Manitoba, New Brunswick, and of course Timmins, among others, all outside of Quebec, where there are strong francophone communities, even if French isn’t the regulated sole official language in those provinces. Although, to be honest, I really couldn’t tell you if there are any bylaws in Montreal requiring a certain percentage of the population to speak French and/or English, but I’d imagine not – I don’t know how they’d regulate that, and I also know of a few people in Montreal who don’t speak French. I was just surprised that stores in Montreal don’t require their staff to be able to understand a minimum level of French since their main job is customer service in a Francophone city. And yeah, just like you, when I was there, besides that one girl, everyone spoke French to me. Interesting question though, I’ll have to ask around. Thanks! It just seemed weird to me as a lot of the places I’ve worked required every employee to have basic french at a minimum and 50% to be fluent. I wonder if it was something that was overlooked as it was never expected to be a problem..
Good point! At all my jobs in Ottawa, my French language skills have always been tested in the job interview process as well. Yes, maybe you’re right, perhaps they thought of English being the default language that EVERYONE understands… which is definitely not always the case. Hi Ngawang, what I meant in my comment on how Tibetans are basing their decision on who to vote for in the upcoming presidential elections has to do with my personal observations. Whenever I’ve had discussions or see discussions on Facebook comparing the two presidential candidates, in probably 90% of the situations, the discussions were based on who would take a stronger stance on China, rather than domestic US policy. And yes, Quebec has a rich history and heritage that can be studied aside from Canadian history. It’s interesting because, like how I mentioned that the Chinese government likes to bring up the Canada/Quebec issue with the Canadian government whenever they bring up Tibet, Kundun and our own Tibetan Government in Exile also like to bring up the Canada/Quebec model when when talking about Tibet (http://montreal.ctvnews.ca/bloc-mp-says-dalai-lama-cited-quebec-referendums-as-model-for-tibet-1.803228). I’m not sure how the Chinese government can bring up the Canada/Quebec issue thinking they’re being clever; Quebec has been allowed to have two democratic referendums over the question of sovereignty, giving people the choice to decide if they want to separate from Canada – something that the present Chinese regime would never allow, let alone basic human rights! The majority of ppeole living in the Province of Quebec, which includes Montreal and Quebec City, speak french as their first language.Canada (also previously called New France) was founded by the French initially thru the travels of Jacques Cartier (1534). Subsequently, Quebec City was founded in 1608 and Montreal in 1634. Hence, by the time the English took over, there was already a sizable settlement of French speaking Canadians in Canada which remains well alive today mostly within the boundaries of the Quebec province. To answer your question, you can speak french anywhere in the province of Quebec. Funny enough, Montreal is probably the place where ppeole speak less french because of its multi-culturalism. You could live on Montreal Island without having to speak French. As for Quebec City, this is probably the city which will remind you the most of France. Downtown Quebec City is still surrounded by the original fortress walls which were erected during the French era.Finally, please note that the accent is very different to the French accent. Apparently (I cannot reference that) we speak with a french accent similar to the one spoken in France in the 1600-1700. Obviously, the influence of the Americans has most likely contributed to the increased use of english-based words in our vocabulary. While I was somewhat annoyed, I hope those like that salesgirl never have to be confronted with this type of violence against them. I would think as a tibetian you would sympathize with the natives who’s culture was destroyed and land was taken by both the french and english. At least quebec culture survives in its home country – France. The natives here in qc are expected to know french, but none of the quebecois were expected to learn their unique language. I do not feel you made a fair comparison here.